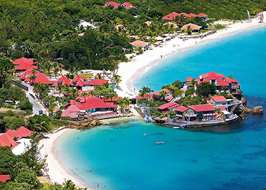 St. Barths, June, 2009 - Hollywood's famed Ocean Way Recording has opened the new Ocean Way St. Barths studio here on the legendary French resort island discovered by Christopher Columbus in 1493, and named for his brother Bartolomeo. The island was first settled in 1648 by French colonists from the nearby island of St. Kitts. The new Ocean Way St. Barths studio is located at The Eden Rock, an exotic resort destination since the 1960s for such celebrities as Greta Garbo, the Rockefellers and the Rothschilds. Just completed is a new 16,000 sq.ft. beachfront villa, which includes four bedroom suites, a 20-seat home cinema that doubles as a professional audio recording space, and a new control room installed by Ocean Way. Housing a wealth of vintage gear alongside state-of-the-art digital equipment, at the center is a vintage Neve console that was used by John Lennon to record Imagine, among countless other historic hits. Installed in the new recording studio are Ocean Way tri-amped high-resolution monitors and a superb selection of microphones and outboard equipment, all in one of the most beautiful resort settings in the world. 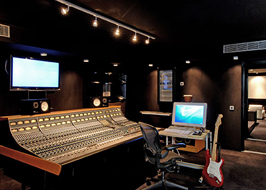 Also included is a wide variety of musical Instruments and the critically acclaimed Ocean Way Drum sample library. Guests of the villa will be able to create full drum tracks with the exact sound of Ocean Way's legendary Studio B.
Hollywood's famed Ocean Way houses some of the best sounding large live rooms ever built. Constructed in 1958, the studios have been the site of an astonishing number of classic and current hit records which have sold in excess of a billion copies worldwide.